Boston, Massachusetts  Celtic Radio is pleased to announce the winners of the 2011 Celtic Radio Music Awards. This Music Awards program was created to promote exceptional Celtic music across 6 categories of music. Nominations for this award are made throughout the year by listeners and members of Celtic Radio. After a careful screening process, which is based upon listener nominations, ratings, requests, and other radio statistics; we select 3 songs across six categories of music for voting: Celtic Rock, Traditional, Jigs & Reels, Bagpipes, Roots Traditional and Contemporary music categories. Voting begins on January 1st of each year and ends on Celtic Radios popular St. Patricks Day celebration. Members of Celtic Radio cast a record of 15,568 votes. This is the most amount of votes that we have received in the past 6 years since the inception of this awards program and is truly a sign that Celtic music is growing in popularity! Winners receive recognition of this prestigious award through the induction into the Celtic Radio Hall of Fame and permission to use the Celtic Radio Music Award banner on their website. Our awards program was expanded in 2008 to include the Celtic Radio Album of the Year award. This award is given to acknowledge musical creativity, extraordinary work and exceptional talent on an album which provides recognition of outstanding contributions to Celtic Music. Winner of this award category receives permission to use the Radio Music Award banner on their website, receives the esteemed and prestigious framed Celtic Radio Award and a beautiful black and gold embossed award plaque. Pictured is a sample of the official music award package that The Gothard Sisters will receive from Celtic Radio. The gold engraved Celtic Radio Music Award (bottom left) is our yearly presentation for the recipient of this prestigious award. Mounted on a black embossed plate and attached to a beautiful oak wooden base, this award is presented in recognition of the Celtic Radio Album of the Year. "In celebration of St. Patrick's Day, Celtic Radio is announcing the 2011 Celtic Radio Album of the Year. What can be said about three sisters who are beautiful beyond belief with pale blonde hair, porcelain complexions and eyes the color of the Pacific ocean? Oh, throw in the fact that they are incredibly talented in so many ways, it fair boggles the brain. Apparently, a lot can be said, since this review was originally three pages long. 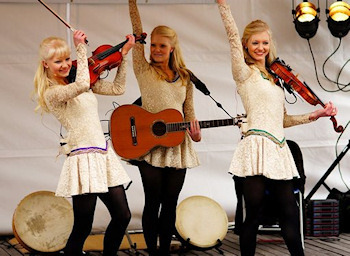 The Gothard Sisters, hailing from the misty Pacific Northwest region of the United States, describe themselves as three sisters performing high-energy Celtic song and dance. The classic understatement, that. Amazingly multi-faceted, each girl brings her own special offering to the plate. While all three play the violin, 16-year-old Solana is also the lead singer and plays the bodhrán, strings, and djembe; 23-year-old Willow plays the bodhrán, mandolin, strings and cajón; and the eldest of the sisters at a mere 25 years, Greta plays violin, acoustic guitar, strings, cajón, piano and djembe. Willow and Greta also serve as backup singers. Oh, and let's not forget that Greta also runs the group's website (Gothard_Sisters) and Willow creates and sews all their costumes. Besides the musical talent they have so obviously been blessed with, the girls are also accomplished dancers. They are members of a Seattle-based Irish dance team that took second place at the 2007 World Championships in Glasgow, Scotland. They dance quite a bit in their live performances, thrilling the audiences with yet another aspect of their considerable repertoire of talent. Story Girl is the groups' 4th album since they started recording 2006 and it has already proven to be a popular addition to Celtic music lovers' collections everywhere. Expect many exciting things to come from these amazing young women (Credit of review to Vickie Yakus). 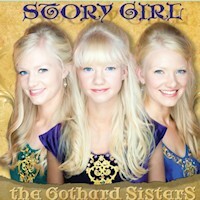 Congratulations to the 2011 Celtic Radio Album of Year award for The Gothard Sisters "Story Girl". A Beautiful engraved Celtic Radio award is being created by our local jeweler and will be mailed to The Gothard Sisters with compliments from our many Celtic Radio supporters that make this award possible! Slainte! - Celtic Radio Music Awards Committee." View 2011 Nominations and Results! To nominate a song for 2011, please contact us with the details of your nomination.